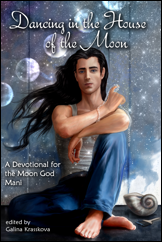 “Dancing in the House of the Moon,” our newest Mani devotional has just been released. This is a first for Sanngetall Press — this particular book is pocket-sized! It is eminently portable and with a gorgeous cover design by artist Lynn Perkins, really stands out as a devotional piece. For those who fell in love with this particular image of Mani, it is available here as a prayer card. There are also two other images of Mani, one by Ve Hardy and one by Grace Palmer. They are lovely additions to any devotional tool-box, as is “Dancing in the House of the Moon” itself. As of August 4, this devotional is available on amazon.